If you tell your kids you are going to climb a volcano make sure you tell them that it was actually a volcano 350 million years ago. When I took my sons to hike Currie Mountain for the first time I left that part out. Currie Mountain is only 10 kilometers from the Westmorland Street Bridge in Fredericton and when we arrived at the mountain they were very excited to get out and see this volcano that I had been talking about. When we started to hike up the trail that follows along the contour of the mountain they started to have their doubts. I may have exaggerated about other hiking trails in the past so they were skeptical. As we turned the corner and saw the chimney, standing tall amongst the giant white pines, I finally told them the truth. The boys didn’t give my exaggeration a second thought as they ran ahead to check out what used to be a small building. The red brick stood out against the light brown of the pine needles covering the surrounding ground. The trail splits into three directions at the building. I imagined that the small building could have been owned by a troll who controlled access to the three trails. A troll who asked riddles. If you guessed the answer to the riddle he would put you on the right path to the top of the volcano. If you answered wrong he would put you on one of the other paths for an unknown fate. I was telling the kids about this as they explored the rubble. Just when I thought they might not be listening to me one of them turned and asked, “Which trail is the one to the volcano?”. I pointed up the hill behind the chimney and the boys ran ahead. Once they reached a plateau they waited. They weren’t sure which way to go. The acidic pine needles keep most of the other underbrush from growing. This makes it easy to navigate in all directions so sometimes the trails are hard to follow. I pointed once again across the ridge that would take them to the peak and they ran ahead. When they scrambled up the rocky peak they were still looking for lava flows. They were a bit disappointed until I explained to them that this was an ancient volcano that used to be a kilometer higher than where we stood. The dark brown rocks were created by lava cooling and hardening. This was a time when dinosaurs roamed the earth. They had a skeptical look in their eyes but underneath it I could see a hint of fascination. When story time was over we made our way down the steep side of the peak towards the front of the mountain, being careful as we made our way between the small cliffs and loose rocks. Soon we came to the trail that goes around the front of the mountain. We turned right, away from the troll’s toll house, and followed the trail to the end. Just past the end of the trail there was a lookout that overlooked Sugar Island and all the smaller islands. As we looked out over the St. John River valley I wondered what it would have been like as dinosaurs walked the earth. How different it would have been if we had been peering down from an active volcano. I wondered if the boys were thinking the same thing. We walked back the trail to the chimney. On the way we checked out some of the larger rocky outcrops of dark brown rock. Some of the large white pine had fallen leaving behind giant barkless stumps that jutted up into the sky. One of them was across the trail. The boys climbed under it while I climbed over. When we once again reached the chimney, the boys asked where the third trail went. I told them that it went back to a small field where Vicki and I had explored on our first visit. We didn’t go all the way to the end but the trail continued to the Carlisle Road. I guess that answer didn’t excite them very much since they turned onto the trail that lead back down the hill. At the bottom of the trail we stopped to read the plaque that explained that the mountain was of volcanic origin. This at least confirmed to them that I wasn’t making the whole thing up. When I continued to read about the mountain being habitat for rare plants, and that the land was a gift from Earle and Louise Turner to the University the kids started to tune out. I told them that the first time I visited the mountain was in a soils class at University. I told them about digging soil pits and they decided that it must have been a boring class. I had to agree with them on that. If you are looking for an easy mountain to climb that is very close to Fredericton check out Currie Mountain. To this date, it is the only volcano I have found in New Brunswick, even if it is 350 million years old. If you visit make sure you bring your imagination. On that trip, the boys both collected a lava rock as a souvenir, and out of all the amazing hiking trails we have hiked since, they still remember the time we climbed the volcano. 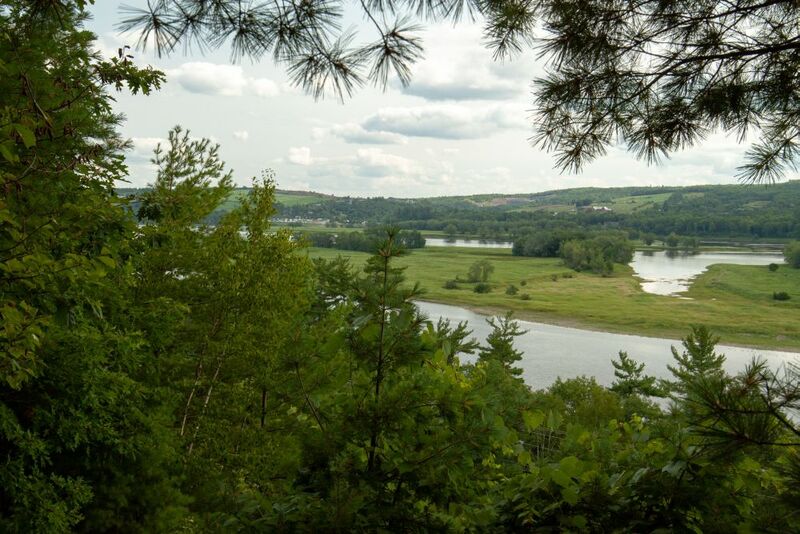 Currie Mountain is only a 10-minute drive from the Westmorland Street Bridge in Fredericton. Just cross the bridge on the north side and continue on route 105 for 12 kilometers until you see the small clearing with a monument tucked into the side of the hill on the right. For more information on the trail go to the Hiking NB Trail page. A video of my last visit to Currie Mountain can be found on our YouTube page. James Donald is the creator of the Hiking NB website. He has been attempting to hike every trail in the province for the last 8 years and has almost reached his goal. He hikes with his wife Vicki and four children. They share their adventures and trail information on the website, on social media, and through presentations around the province.